Looking for a new homemade pizza recipe? Take it outside and try pizza on the grill! 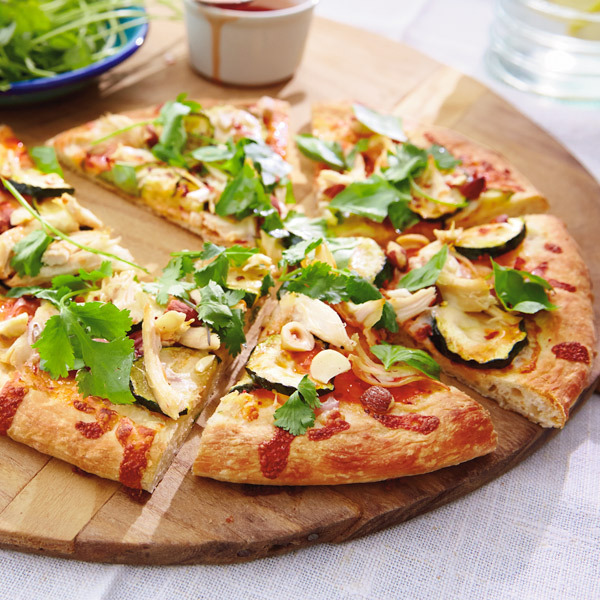 Our adventurous Thai Chicken Grilled Pizza recipe features smoked chicken, zucchini, sweet Asian chili sauce, cilantro and basil for a tasty twist on traditional pizza. Make those slices extra nice with our easy cold-fermented homemade pizza dough. Evenly spread the Asian chili sauce on the surface of the dough. Add the sliced shallots and zucchini. Top with the red chili flakes and shredded chicken. Top with the cheese. Slide the pizza on the preheated pizza stone. Grill for about 10 to 12 minutes, turning once or twice during the process. Remove the pizza from the grill once the pizza dough is golden around the edges and the cheese is nice and bubbly. Check the bottom of the crust to decide when to remove (don’t let the bottom burn). Using the pizza peel, transfer the pizza from the stone to a wire rack and let the pizza rest for 5 minutes. Before serving, lightly drizzle the pizza with more Asian chili sauce, and top with the chopped nuts and fresh cilantro. Top with fresh basil (optional). Cut into wedges and serve warm.